Hop on the next available train » (HOTNAT) allows travelers to take the next high-speed service leaving from the same station as originally planned when a delay on or cancellation of a preceding Railteam member’s high-speed service prevents them from making their originally-planned connection. This service is free of charge and is subject to the following conditions : the connection that was missed must be between two high-speed trains of the Railteam Alliance. HOTNAT only applies at the station at which the passenger originally planned to change trains and in cases of train delays and train cancellations. The approval of HOTNAT is subject to the available capacity on board each train. Seats are not guaranteed. Things may be complicated by the rules changing over time, and by some rail staff being unaware of current rules. 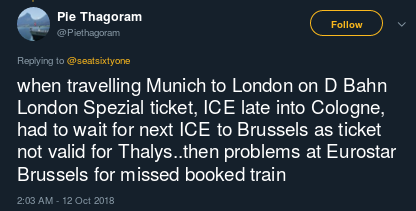 So, if this does happen to me and I simply walk onto a Thalys train with my original DB ticket and a stamp proving the delay, do I risk being forced to buy a walk-on fare? Are the Thalys staff sometimes unaware of the HOTNAT provisions (in which case it might help to carry a print-out of the web page), or am I misreading the HOTNAT rule? Ideally, if there is enough time, you'd go to a DB ticket counter in Köln Hbf and get this stamp, which validates your ticket for Thalys. I can only guess that a regular DB stamp might not be generally recognized by other train operators, hence this special Railteam stamp. 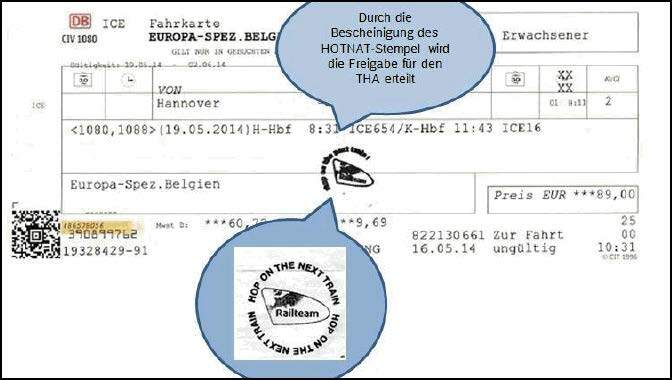 Are the Thalys staff sometimes unaware of the HOTNAT provisions (...) ? Considering the negative examples you found, it's probably fair to say that we're likely to make bad experiences public in the hope of some improvement, while we see little reason to talk about the ordinary, that is, when things went smoothly. Not the answer you're looking for? Browse other questions tagged trains europe delays deutsche-bahn thalys or ask your own question. During Thameslink disruptions, are there any pre-prepared maps for alternate routes?